These shoes were sold by Olivier Coutau-Bégarie at Drouot auction house in Paris on 17 October 2012. The full catalogue of royal artifacts which were up at auction is here. Perhaps fittingly, and in stark contrast with the grim recession, they were sold at way above their expected price, for USD $81,275, to a telephone bidder. 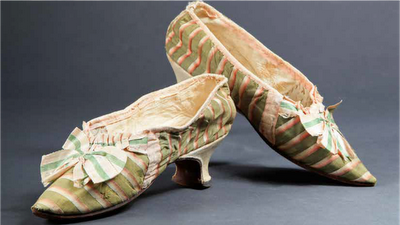 Quigley's Cabinet: "The shoes are green and pink silk with wooden heels and a pointed toe. They measure ... 24cm long x 6cm wide x 10cm high."